The remarkable story of a beautiful mind. One of the many documentaries this year profiling one of the remarkable minds of this world is titled simply Hawking, about the planet's most famous living scientist Stephen Hawking. This first premiered at the SXSW Film Festival earlier in the year and has a September release date in the UK, but no US release set yet, unfortunately. Our friends from the UK recently got their hands on the new quad poster for Hawking, promoting the upcoming theatrical release on the other side of the Atlantic. It's a cool poster for a doc I'm already anxious to see. Hopefully it's as good as the quotes claim. Hawking is the extraordinary story of the planet's most famous living scientist, told for the first time in his own words and by those closest to him. Made with unique access to his private life, this is an intimate and moving journey into Stephen's world, both past and present. An inspirational portrait of an iconic figure, Hawking relates his incredible personal journey from boyhood under-achiever, to PhD genius, to being diagnosed with Motor Neuron Disease and given just two years to live. Despite the constant threat of death, he manages to make many remarkable scientific discoveries and rises to fame and super-stardom. 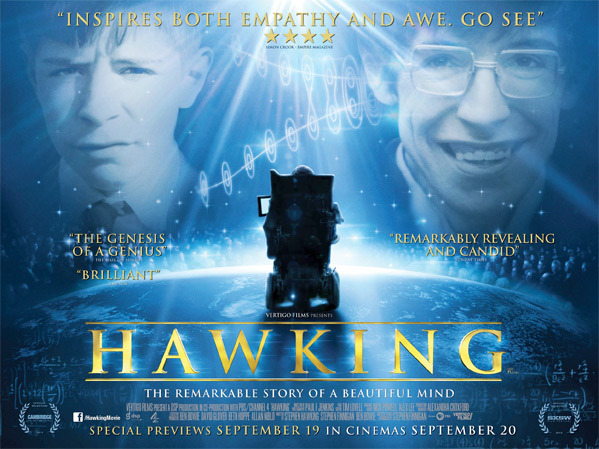 Hawking - a remarkable man, and a remarkable movie. Directed by Stephen Finnigan. Arriving in UK theaters in fall. Looks like a 90's Disney flick.